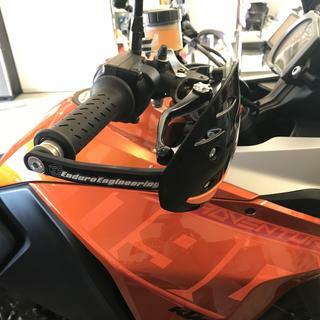 The Enduro Engineering Evolution Debris Deflectors are a set of wraparound handguards that take Enduro Engineering’s typical high level of protection and applies it to both your hand and your handlebar controls. So while EE is known for their bombproof skid plates and guards, the Evolution Deflectors are every bit as capable and every bit as valuable from a bang for the buck standpoint. EE goes with a proven and robust design that uses a solid 6061 T6 aluminum alloy bar, billet adapter mounts, and zinc plated hardware at both the bar end and deflector. 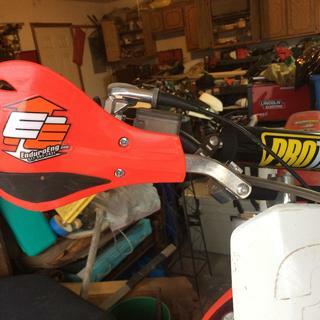 With this design the handguards get extremely solid mounting points, an easy installation, and plenty of room inside the guard for your hands and levers. You’ll also get a large range of colors for the deflectors and finishes for the aluminum hard parts. these are some of the better looking guards available, good price and value, still doing the job at 16 hours use and no issues. Really like the quality and fit of these hand guards. Rocky Mountain was great to deal with and shipped them right out to me, no complaints great service. Easy install. They look great and are beefy. Surprised how light they are. Recommends silicone be applied between aluminum and plastic shield. I happened to have some marine grade silicone so I used that. The key to assembling these easily is to just barely thread each fastener until it’s completely assembled. Then tighten everything down. 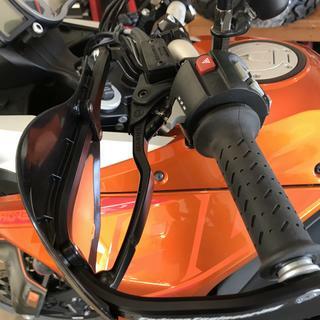 The handguards fit perfectly on the bars although the length of the guard bars and the mounts position left very little room for the brake and clutch lines. Protect those KTM 65 levers! EE all ways sells good solid products that fit well. Bought these for my sons 65 and they fit great! Plus is not breaking levers on the lay downs in nasty rock piles. have not found a better bar design for the money. proven in many many wrecks and encounters with trees while riding rocky single track. These fit well and look good. The words fit well and handguards do not often go together. They do with these. By design they clear wires/cables well. You may have to saw 1/2" off the end of the handlebar for the inner clamp to clear the cross bar on 7/8ths bars. A narrower handlebar is a good idea for woods riding anyway. I have mounted these on a 2006 Honda CRF250X, a 2001 Kawasaki KDX220 and a 2003 Suzuki DRZ250. They all fit well and look good. I use blue loctite on the inner mount screws. Great guards for the money! These look great, are heavy duty and easy to install at a fraction of the cost of others available. JUST DO IT! Needed slight modification to fit the right, brake side for clearance. I added an aluminum spacer (see pics). Other than that, great product. I've use these on my race bikes and wanted to see if they would work on the 1190 Adventure. I ordered the (1 1/8" Pro-Taper/Renthal Fat Bars/Neken). These are the best barkbusters. Ive used the cycra pro-bends, acerbis, and all the rest. Always come back to the EE guards. Theyre tough, sturdy, and the best bang for the buck. Provide great protection too. Highly recommend mounting them with threaded bar-end inserts. Enduro Engineering Evolution Debriis Deflectors bolted right on , perfect fit ! All necessary parts were there and easy assembly! Gives great protection for your hands and levers ! 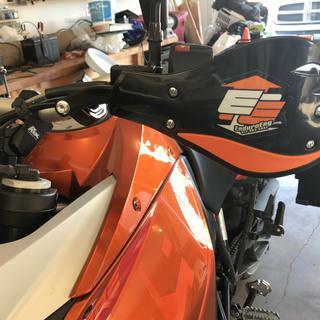 I’ve hit many trees with these hand guards and they hold up very well and dropped the bike in the shop on the concrete and they seem to even with stand that, I would recommend these hand guards they are very easy to install and even look good on the bike. Love the product. Easy to install on my yz 250. Look awesome. Like the fact you can inter change the plastic shields. These were for my 2017 690 enduro r and they didn't fit very well at all. I had to do a lot of bending to make them fit. They also aren't as big as I thought they would be but after the modifications, they should be ok. I always use EE handguards. I prefer them over other brands including cycra. Like all full-wrap handguards, installation is a little tricky, but not hard. Coverage and protection is good, but the way they secure the plastic defectors to the guards is not good. They easily break off in a fall. I would recommend drilling and tapping the guards and mounting the deflectors directly to them. Just a few rides so far but found them to have great coverage in the brush. Haven’t laid the bike down with them yet. Can’t go wrong with the price and have a nice classic design. I've put these hand guards on my 2014 wr450f and my 2016 YZ250X. They've held up great and they look fantastic. I have Fasst Flex bars on my WR and the guards made specially for the Flex bars work perfect. Great looking, very stable, stays in place after falls, hard to install and get positioned on 7/8 bars for me. Took several tries to get alignment right. These hand guards work as advertised. The fit and finish are great and they are easy to install. This is my second set on different machines. Have taken many hits and a lot of abuse. Plenty of spacing between levers/controls, no bends, breaks, complaints. Some of the easiest full wrap handguards to install. I like the plastic shields in that you can replace them easily and don't have to drill into the aluminum bars to mount. Bar end mounts for steel and aluminum bars are included. And I actually prefer the non-pro bend style metal guard like these. Simple hand protectors. Pretty easy to install. I recommend calling to make sure you get the right size as it can be deceiving. I actually got the wrong size and EE said they would replace them. But I already used them, will likely just buy another set as I tend to run into trees. Awesome look and protection. Bolted right up to my twin walls, have tested their durability unfortunately, and they have not faulted. If you are going to buy a pair of bark busters, don't waste your money on cheap one Get These. They work great. I have owned several pairs of these brand and of other brands. But these are the best. Quality product. Easy to install. Good protection from rocks, trees, etc. Like the design/style. Best wrap around hand guards out there! Buy them! Made in USA and better yet MICHIGAN!. Buy American and hire American. America first! EE bark busters are tough. I got sick and tired of my Cycra Pro Bends twisting and bending and breaking. I race single track and need a really tough hand guard. I purchased the EE's and I'm really happy the way they performed the first race. The locking system used for the inside of the bars on the EE's are far superior to those used by Cycra. Highly recommend. I used these with the BRP Hand Guard Mounts and the BRP bar end inserts. Much more solid mounting system, although the supplied mounts appear to be pretty adequate. With the mounting system I used, they did not even require tweaking to fit, even with cut-down OEM bars. Another fine product offered by a great company! I ordered two sets. One of the pro taper sets for my 15 yz250f and one for my sons yz85. They both mounted up easily. As always with Rocky Mountain ATV I received the handguards very quickly and at a good price. Thank you Rocky Mountain ATV. Works great. Saved many bent or broken levers. Easy to install. Really protects hands when going through tight, grown in trails. These are solid bark busters. Crashed with them several times and the held up great. Look not further and just buy these you will be glad you did. These thing are awesome. I've put these on every bike I've owned and when I need to replace them (which is almost never) I put another set right back on. They are rugged, they hold up to anything, they take a beating, and they use what I consider to be one of, if not, the best bar end mount in the game. Far superior to Cyrcra's bar end mount system in every way. Awesome piece of kit for the price! You must use silicone between the plastic and bar to keep it form sliding during a fall. Just follow instructions. In my opinion, these are the best bang for your buck. Super strong, look great and for a decent price! Nice protection, easy to install, and lightweight. Love these. I have a pair of the Acerbis for my KLR and these for my KTM. Both are strong but the EE feel like they give my hands more freedom to move while still protecting. These hand guards are well made and easy to install. They also look great. Will these work on 2017 150 xcw? Neken bars come stock with it. not sure acout 7/8 or 1 1/8? BEST ANSWER: Yes they will, you will need the 1-1/8 oversized mount kit I'm pretty sure. The 7/8 is the old style small bar with the cross bar. But not the rental twin wall mount those are different and will not work. They should work fine. All the sets I purchased had the bar inserts for both size bars. The Neken I believe are a 1 1/8 bar mount size so that will be the size you should order. Need to figure out the diameter of your bar but they should work. 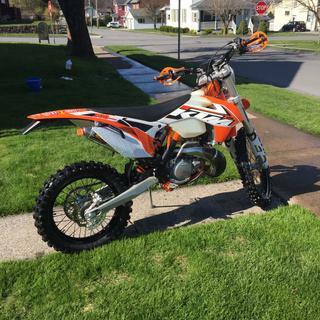 Have a 2017 XT250 with stonemen fat bars 28mm 1 1/8 will this work? BEST ANSWER: Yes, be sure when selecting the size you choice the one that is listed for, 1 1/8" Pro-Taper/Renthal Fat Bars/Neken. can you remove the emblem on the plastic so that it is just orange? BEST ANSWER: Yes. The emblem is just a sticker. I most always pull the sticker off at install. Yes you should be able to remove. It is just a sticker. Yes, with a heat gun and some glue remover. Yes the logo on the plastic is removable. Yes. It’s just a sticker. Do these fit around standard length clutch levers? BEST ANSWER: That could depend on your handle bars. I have these enduro engineering bark busters on my bike with Renthal twinwall fatbars. I have my clutch perch pushed as close to the cross bar as I could get it and it was enough to fit with a bit of extra space. I also rolled my clutch lever down so it slightly hangs lower than the bark buster bar. That way the lever isn’t even with the bark buster when pulled in and it won’t pinch your glove between the busters and lever. I have a standard length works connection clutch lever on my Cr and it all works fine. Good luck. Yes they do. Some application require the user to adjust the lever to accommodate the Debris Deflector. I had to loosen my perches and slide my levers inside the bar to get a good, comfortable fit for me. Yes Michael, mine fit just fine. But I have not cut my bars down. They are stock length. They did fit several KTMs in my family. Will these fit a 2007 ktm 65? BEST ANSWER: That I am not sure the issue I had was the handle bar width be sure to measure that before purchase as there are different sizes. on the clamps and your bike . Yes, as long as you have installed the actual aluminum guards. They worked on the Honda CRF 100. Will these fit on a Yz85? and check part numbers for that bike. Then order them from Rockymountain. Another option is ordering RM brand. We have them on many different bikes including ttr 125 and ttr90. I just put a set of the 7/8 ones on my sons 02 yz85 and they fit but, they angle down a little. Not a big deal they still look like they will offer good protection. They should fit as long as you order the correct handlebar diameter. You might have to drill a extra hole in the bar for the mounting bolt if they are to long . I don't believe they will, they are for big bike fat bars. You may also want to contact EE to verify and check for other options. Unknown. I applied them to a KLR650, 2008. They would seem "universal" to me, however. Which will fit a crf 125f 2014? BEST ANSWER: These are a universal fit, make sure you check your bar size, type prior to ordering, fat bars or protapers require a different clamp bracket. I run these on four of my bikes, they are great and hold up well. Select the size for the "7/8 Bar"
Which size will fit the tusk chub bars? Do these come as a pair or do I have to buy two? BEST ANSWER: These come as a pair. Will these fit a ‘17 husky/KTM 50? 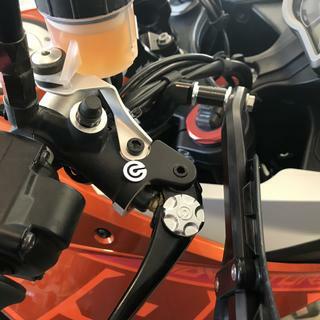 It’s fit for ktm 350 exc-f 2018? 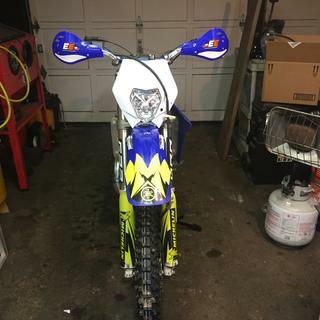 Will this fit a 2019 yz250x? 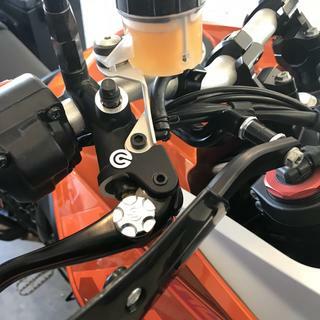 What size will fit stock bars on a 2018 ktm 250 xcw? What size would a 2018 yz250x need? BEST ANSWER: We recommend using our part number 50-5214B, which is for the 1 1/8" ProTaper handle bar. Will these have enough room for a atv? BEST ANSWER: We have not test fit these on any ATV models but have had customers report that they do work. 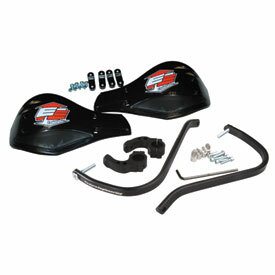 You may also want to check out our Moto Roost Deflectors for an easier installation. 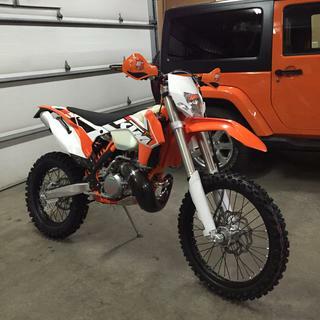 What size for a 2016 KTM 250xcw? What kind for mika metals 1 1/8 bars? BEST ANSWER: Our part number for the Mika Metal kit is 50-5116B. RMATV does not currently stock these but if you were to contact them they could be special ordered. Do these guards fit Flexx Bars? BEST ANSWER: We do offer them to fit the Flexx bar. They are only offered in silver. Select the silver color with any color deflector and then select the Flexx brand handle bar. Hope this helps and thank you for the interest in our products.